Violinist Andrew Williams has established himself as an extraordinary chamber musician, soloist, and teacher throughout America. As a former member of the critically acclaimed Fifth House Ensemble, he has performed at Columbia University’s Miller Theatre on their Composer Portrait series and on Rush Hour’s yearly summer music series. Considered a champion of new music, Williams has commissioned a number of works for the violin. He has also given seminars on composing for the violin at Roosevelt University and the Fresh Inc. festival. In November of 2011, he performed Kevin Puts’ epic solo piece “Arches on a Rush Hour Encore,” which was broadcast live on Chicago’s WFMT. 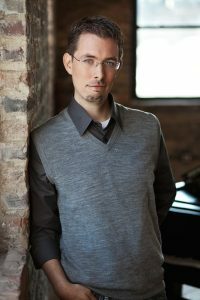 Andrew serves Carthage College as an adjunct professor of violin and teaches at the nationally renowned Merit School of Music, where he has been on faculty since 2008. Andrew received his bachelor’s degree in violin performance from the Cleveland Institute of Music and his master’s from Rice University. Former teachers include Ilya Kaler, Kathlene Winkler, David Cerone, and David Updegraff. “INCANTATION” from NMC 10th Anniversary by Andrew Williams violin/Augusta Read Thomas, composer.